The weather outside might be frightful but your skin doesn’t have to be. When the air starts to chill here are a few helpful tips to make it through this season change. For many people, winter brings more than just a rosy glow to the cheeks. They also bring uncomfortable dryness to the skin. As soon as you turn the heat on indoors the skin begins to dry out. Here are some tips for boosting your skin care regimen to help you keep your skin in good health throughout the winter. First, you may need to change your cleanser to one that is more hydrating and gentle. The key word here: hydrating! Especially in the wintertime, it’s important not to strip the skin of essential oils. My go-to cleanser is SkinCeuticals Gentle Cleanser to remove impurities while soothing and calming the skin with orange oil and skin conditioners. I also recommend Intraceuticals Gentle Cleanser to protect the skin’s natural barrier with coconut and fruit sugars; it calms redness with chamomile and ginger root extract to soothe the skin. These will get your skin squeaky-clean without compromising its protective barrier. Dead skin cells can prevent moisturizer from absorbing completely, so use a mild exfoliator once or twice a week to prevent buildup. Instead of foaming scrubs, use hydrating scrubs to gently remove old skin cells without stripping the skin of its moisture. My go-to exfoliant is Intraceuticals Enzyme Exfoliant its more than just an exfoliant it redefines skin resurfacing through the use of fruit enzymes, lactic acid, and bamboo beads to lift away dull skin. It’s no secret your skin needs a moisture boost when humidity drops. Moisturizers will target dry skin when the skin is unable to produce enough sebum to provide moisture naturally. My favorite is SkinCeuticals Triple Lipid Restore 2:4:2 this product helps restore skin’s external barrier and support its natural self-repair. Intraceuticals has a great 3 step system to Revive, Replenish and Protect the skin each step is a different molecular size of hyaluronic acid to hydrate, tighten and enhance while nourishing the skin to defend it against dryness. This three-step hyaluronic layering system pairs well with our in-office O2 Hydrating Facial to truly combat the winter weather at the next level. Hydrators on the other hand target common causes of epidermal dehydration that can be caused by seasonal changes, sun damage, diet or medications. Why should you include Hyaluronic acid to your skin care routine? Hyaluronic acid is the body’s natural hydrator, making it an excellent moisturizer when applied topically. A natural humectant, hyaluronic acid is capable of holding 1,000 times its own weight in water. My favorite recommendation for ALL skin types is SkinCeuticals Hydrating B5 Gel. This oil-free moisturizing serum combines vitamin B5 with hyaluronic acid, the body’s natural hydrator, to help bind moisture to the skin. It can be used alone or with a daily moisturizer to provide extra hydration, and is an ideal moisturizer for acne prone skin. Lastly, when choosing moisturizers and hydrators for your skin be sure to look for “non-clogging” oils, like avocado oil, primrose oil, or almond oil. Shea oil — or butter — is controversial because it can clog facial pores. You can also look for lotions containing “humectants,” a class of substances (including glycerine, sorbitol, aloe, hyaluronic acid, etc.) that attract moisture to your skin. I think we can all agree that chapped lips are a fact of life during winter, but by regularly applying a hydrating balm, we can stay ahead of the dryness. 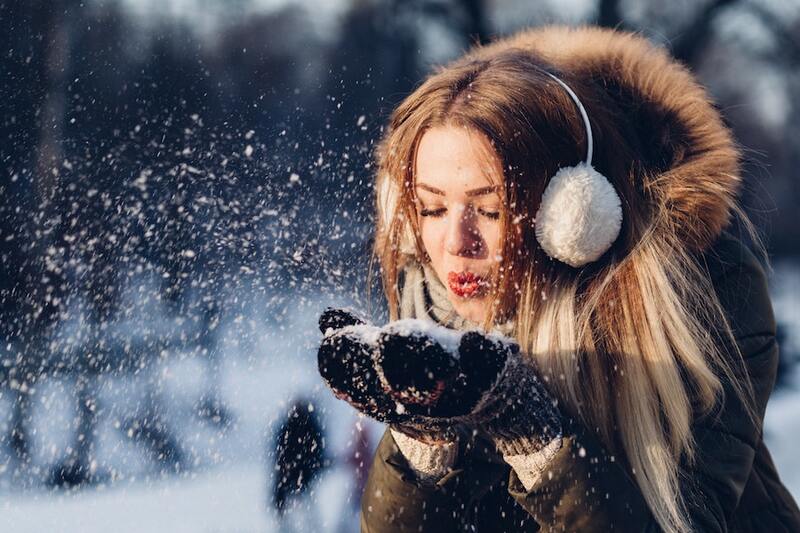 Lips become chapped from go out in the cold and not wearing a protective barrier on our lips, leading to windburn. Overheated homes also play a role so using a humidifier can help. Any balm that contains wheat germ oil, almond oil, jojoba oil, coconut oil, aloe vera, shea butter, sunflower oil, grapeseed or cottonseed oil, will do the trick. For the ladies, I suggest we avoid the use of long-lasting or matte lipsticks because their ingredients tend to cause dryness. Wet socks and gloves can irritate your skin and cause itching, cracking sores, or even a flare-up of eczema. Central heating systems (as well as space heaters) blast hot dry air throughout our homes and offices. Humidifiers get more moisture in the air, which helps prevent your skin from drying out. Place several small humidifiers throughout your home; they help disperse the moisture more evenly. If you’ve heard it once, you’ve heard it a thousand times: Drinking water helps your skin stay young looking. In fact, it’s a myth. Water is good for your overall health and the skin of someone who is severely dehydrated will benefit from drinking more water. But the average person’s skin does not reflect the amount of water drank. It’s a very common misconception. Drink Up! It’s good for your overall health. It’s very tempting to want to soak in a hot bath after being out playing or working in the cold. But the intense heat of a hot shower or bath actually breaks down the lipid barriers in the skin, which can lead to a loss of moisture. My suggestion is to just use warm water and staying in the water a shorter amount of time. A simple lukewarm bath with oatmeal or a small amount of grapeseed oil can help relieve skin that is so dry it has become itchy.